Technology should be used to jam mobile phone signals in prisons, an inspector at Britain's largest jail has said. 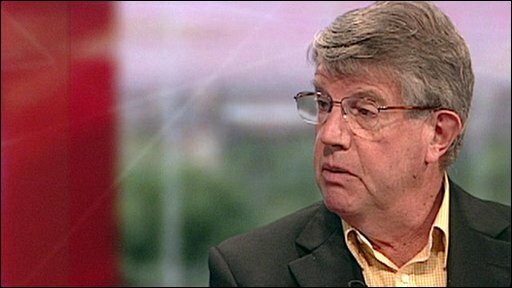 David Jamieson, chairman of Wandsworth prison's Independent Monitoring Board, says illegal phones fuel prison drug trading, bullying and gang problems. Behind bars, phones can cost £400 each. He said the trade had been worth £9m in 2008, when 7,000 phones were seized. The Prison Service says signal blocking is technically challenging and not quick, simple or cheap to implement. Mr Jamieson told the BBC's Inside Out London programme he believed three times as many mobile phones were in circulation within prisons as had been seized. Ever-smaller handsets allow phones to be smuggled in by prisoners, visitors or corrupt staff, he said. Some are even thrown over prison walls. It would be impossible to stop them coming in, Mr Jamieson said, but signal-blocking technology would render them useless, preventing prisoners from using them to co-ordinate crime and intimidate witnesses on the outside. Mr Jamieson said: "The technology... does exist. It would cost about £250,000 to equip a prison to jam calls. That would pay for itself quite easily over time." However, he accused the government of "pussyfooting around" the issue. The Ministry of Justice said it was already an offence to smuggle a phone into prison and that a new bill included laws intended to make it illegal to possess one in jail. "The objective of this clause is to act as an additional deterrent to those who consider trafficking a mobile phone and/or its component parts into a prison, or to have them in their possession and to punish those who do," said a spokesman. Viewers in London can see more on Inside Out on BBC1 on Monday at 1930 GMT, and across the UK on the BBC iPlayer.